The choice whether to purchase the military’s Survivor Benefit Plan (SBP) coverage may be the largest financial decision of your life. As I’ve discussed extensively, it is a very individual decision and there is no best answer for every situation. While I’m trying to hit on every possible consideration, it is important that you get information from a wide variety of sources. I recommend the following resources for the three distinct phases of the decision making process: education, analysis & consideration, and individual decisions. In this stage of the process, you are gathering all the facts about SBP: what it is, how it works, etc. The SBP classes held at your installation’s family readiness center. Keep in mind that some classes are better than others – this should not be your only resource. 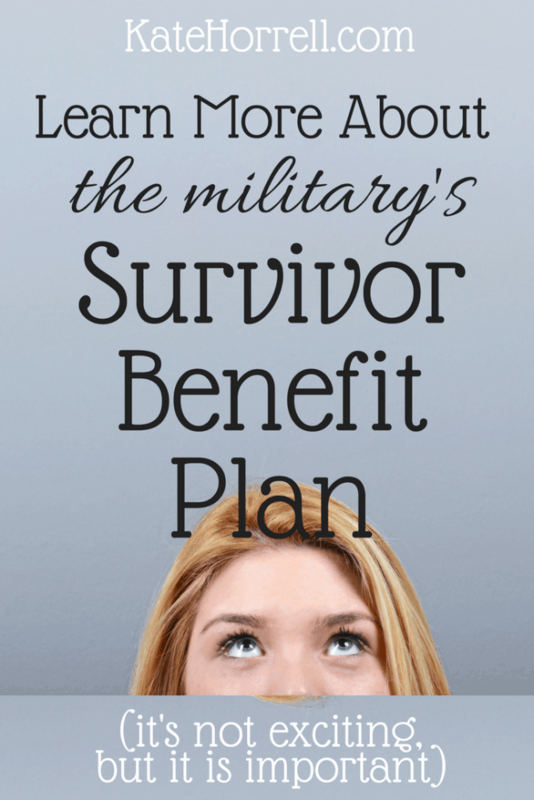 The book Military in Transition’s Guide to The Survivor Benefit Plan: Navigating the SBP. Written by a financial planner who also happens to be a retired Navy guy, this book looks at all aspects of the SBP decision making process. MOAA’s Should You Enroll In The Survivor Benefit Plan? Once you have a firm grasp of the facts of the SBP program, and the various considerations, then you need to apply this information to your family’s specific situation. This includes your other streams of income, your assets and liabilities, children, special needs, spousal employment and employability, health history, ages, goals, wishes, and desires. And don’t forget the “sleep at night” factor – the SBP decision has an emotional component, as well. The financial educator at your installation’s family readiness center. This person should be well-versed in SBP, but that isn’t always true. Plus, as individuals, we all bring our own bias to the conversation. While this is a great resource to figure out how to apply the SBP offer to your unique financial situation, please don’t expect (or let) the financial educator to make the decision for you. The online or telephone financial education available through Military One Source. Same warning as above. If you’ve exhausted all these resources, and you still aren’t confident in your decision, then you may benefit from the help of a fee-only financial planner who understands military benefits. Be careful, though, that the financial planner doesn’t have a financial interest in steering you away from SBP and towards a product that will give them a commission. This list is definitely not comprehensive, and I intend that it will grow as I continue to find more resources. If you have suggestions, please drop them in the comments. Together we can learn more! Thanks! I hope that we can get the word out! But can a member with eligible children only elect spouse coverage at retirement or must it be spouse and children or only children? If as the spouse I waived my coverage at retirement, could we also elect not to cover the children or is that required to still cover eligible children? Now becoming a divorce issue. Chris – if you are married with children at retirement, you may choose spouse only, spouse and children, or child only coverage. There is no requirement to cover anyone at retirement. I hope that helps.